My theme for this still life was “fantasy literature and gaming”. I dug through my closet boxes and found a couple old paperbacks and playing cards. 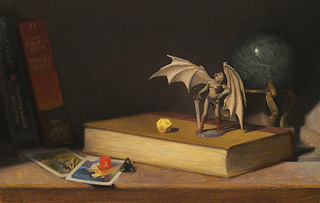 I paired those items with gaming dice (d4, d6 & d12) and a 72mm figurine I had painted a few years earlier. The faux marble ball & pedestal had been lurking on my wife’s bookshelf for a couple years. The dramatic lighting for the setup was achieved by staging the still life in a crate covered in foam core to block out unwanted light. I eventually dropped some of the elements of the crate from the painting, opting instead to leave the composition more open.